Talk about a buzz kill! Frequent drinkers of alcoholic beverages who overindulge during the holidays may find themselves in the hospital emergency room for treatment of Holiday Heart Syndrome (HHS), even when they have no prior history of heart disease. Although there is some evidence that alcohol is cardiotoxic, it has yet to be determined why heavy alcohol consumption can result in symptoms of shortness of breath, chest pain, lightheadedness, and the more worrisome atrial fibrillation, a very rapid abnormal heartbeat. Possible causes of atrial fibrillation after heavy alcohol intake include cortisol and adrenaline surges, a rise in the plasma level of free fatty acids, and altered electrical currents of the heart brought about by lowered levels of sodium, potassium and magnesium, resulting from increased production and elimination of urine. For otherwise healthy, but susceptible individuals, the heart muscle can be seriously weakened when exposed to excessive amounts of alcohol. For those who are thinking that “excessive” is the key word here, the number of alcoholic drinks defined as excessive may be surprising low. For women, heavy alcohol intake is defined as consuming seven or more drinks per week or more than three drinks at one sitting. For men, its fourteen drinks per week or more than four at one sitting. 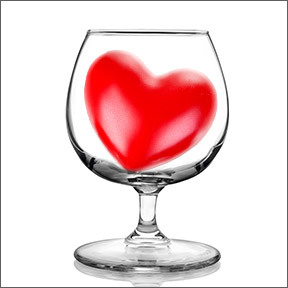 This may seem contradictory, as low levels of alcohol–one to two drinks for women and one to three drinks daily for men–is considered cardioprotective. During the upcoming holidays, there may be many occasions to imbibe and celebrate the season by lifting a glass or two or three. One good reason to set a limit on the amount of alcohol consumed, especially in the absence of nutrition, is that alcohol misuse can result in severe metabolic and electrolyte disturbances. Atrial fibrillation is the most common rhythm disturbance associated with alcohol consumption. Additionally, incidences of heart injury and deadly heart attacks rise during the holidays. December 25th and 26th along with January 1st are the most common days of the year for fatal heart attacks. These unfortunate incidences can be the result of Ignoring symptoms of heart issues leading up to the holidays, loneliness and depression, general holiday stress, overindulgence in food and drink, and increased or unusual physical activity complicated by the cold, such as snow shoveling. Take a little time each day to unwind and de-stress. There’s little doubt that holidays can be awesome but also highly stressful. Setting aside just 10 minutes of quiet time each day to relax and concentrate on breathing can help to lower blood pressure and heart rate and readjust the day’s stress response. Pay attention to your general health. In the hustle and bustle of the holidays, some tend to dismiss or ignore symptoms of ill health. Rather than put aside any abnormal or uncomfortable symptoms, seek medical attention, especially if you experience abnormal heart rhythms. Be kind to your heart. Get some exercise each day. It can be something as simple as taking a short walk after dinner each night. Bring the dog and the kids, as everyone can benefit from family time along with a bit of exercise. Exercise is essential for cardiovascular health and can help to alleviate stress for both humans and pets. Monitor portion sizes. You don’t have to avoid all holiday treats. In fact, you should enjoy them in moderation. Avoid overindulging in foods that differ from your normal diet, such as those that are high in sugar, cream and salt. Holiday food choices can be difficult, especially for those with diabetes, allergies or high blood pressure. Limit caffeine and salt. Too much caffeine can have negative consequences. Caffeine can interfere with sleep and trigger heart rhythm problems. Additionally, like alcohol, caffeine is dehydrating, which can lead to disturbances in electrolyte balance. For those with a history of high blood pressure or heart valve problems, excess salt consumption can further increase blood pressure and lead to fluid buildup in the body and heart chambers. Drink responsibly. Per the National Institutes of Health, alcohol has a definite role in cardiac arrhythmia either by chronic abuse or binge drinking. To avoid potential HHS try to follow recommended guidelines for daily alcohol consumption. You can still participate and have fun while being aware of your alcohol intake. If don’t ascribe to the philosophy that not waking up hungover means you didn’t have a good time, your heart and your body will thank you in the morning. This entry was posted in Home and tagged Be kind to your heart, de-stress, Drink responsibly, general health, Holiday Heart Syndrome, Limit caffeine and salt, Monitor portion sizes. Bookmark the permalink.